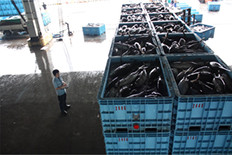 Japan’s Tohoku Region, including Fukushima, Miyagi and Iwate Prefectures is an important producer of fisheries products. Delicacies like sashimi and sushi from locally-captured salmon, tuna and sea bream may be familiar around the world. But the region also produces world-class oysters and abalone, as well as a range of local dishes deeply embedded in cultural traditions. Here are three lesser-known examples that visitors can try. The English author Jonathan Swift once quipped that “It was a brave man who first ate an oyster.” Now oysters are a much-sought delicacy around the world, but perhaps the brave men of today are discovering “hoya”, which is translated somewhat optimistically as “sea pineapple”. Officially a species of sea squirt, hoya is sometimes eaten raw in vinegared soy sauce, and in some cases is quickly roasted on an open grill. This simple yet filling dish combines elements of the land and the sea. Japanese rice grown in rain-fed paddies in the countryside forms the hearty base, and is topped with fragrant green shiso leaves. Next comes a hearty helping of salmon roe (Harako in the Tohoku dialect) topped by a few strips of dried seaweed paper (nori) and perhaps a bit of wasabi and soy sauce. Sea urchin is another beloved specialty of Japan, and the country’s northeastern shores are a fertile fishing ground for “uni”. 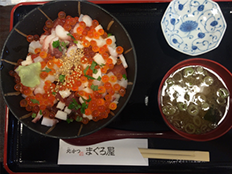 Visitors may find it served raw on top of rice with salmon roe (uni-ikura-don), or served simply on a sushi platter with a bit of soy sauce and wasabi. 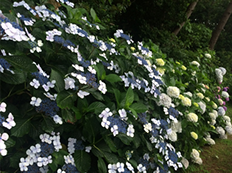 Northeastern Japan is famous for many things, including delicious seasonal vegetables and fruits, fresh seafood, stunning natural scenery, and warm hospitality. As the region continues to recover from the events of 11 March 2011, one way to support local communities while also enjoying some of Japan’s most beautiful landscapes and seascapes is to spend time traveling in the Tohoku Region. 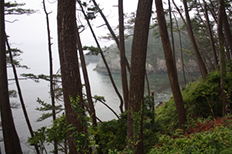 One of the optimistic responses to the Great East Japan Earthquake and Tsunami of 11 March 2011 was the establishment of the “Sanriku Fukko (reconstruction) National Park”, which extends across 14,000+ hectares and the coastline of three prefectures. 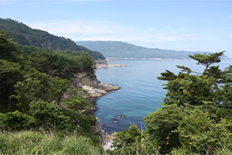 Known for its jutting coast, which has earned it the name “The Sea Alps”, Tohoku’s coast is home to many species of birds including black-tailed gulls and petrels. 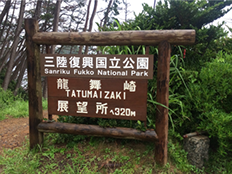 Other natural attractions include the Towada-Hachimantai National Park, established in 1936, and containing forests, natural hot springs, and untouched mountain landscapes. The Bandai-Asahi National Park extends across three prefectures, and boasts wild populations of antelope, black bears and other species. On 11 March 2011, Japan experienced an unprecedented “triple disaster” when the Great East Japan Earthquake and Tsunami triggered a series of accidents at the Fukushima Daiichi Nuclear Power Plant. As a result, local residents have been exposed to a range of both physical stresses and psychological stress related to prolonged displacement and concerns about exposure to radiation. Despite rigorous testing, consumers of seafood and other foodstuffs produced in Fukushima and across the Tohoku Region continue to demonstrate concerns about food safety. Here, additional information and links are provided about radiological monitoring and testing, as well as links to the latest expert reports and research from the Japanese government and the international community. The Nuclear Regulation Authority of the Government of Japan has been monitoring seawater radioactivity since the 11 March 2011 nuclear accident. Detailed weekly are published of samples within a 2km, 20km, and 100km radius of the nuclear power plant. Additional samples are collected in neighboring Miyagi, Ibaraki and Chiba Prefecture as well as the open sea off the coast of Eastern Japan. 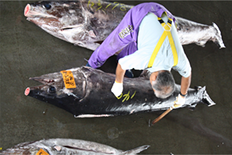 According to the website of the Fisheries Agency of Japan, extensive precautions have been taken on the monitoring of radiological contamination in fisheries. Marketing and sales of all coastal and bottom fisheries in Fukushima Prefecture were suspended after the accident, and the fishermen themselves voluntarily suspended fishing activities. Continuous testing continues and has shown a substantial drop in radiological contamination. For example, in the three months after the nuclear accident began (April-June 2011), 57.7% of samples exceeded government limits. By early 2015 (January – March), only 0.2% of samples exceeded government limits. As a result of these substantial decreases in measured cesium concentrations, trial fishing operations have been initiated for 27 species (full list available here). Yagi, N. (2015) The state of fishing industry in Fukushima after the nuclear power-plant accident. In addition to official monitoring and publication of sample data by the Japanese Government, the international community is also fully involved in supporting the Tohoku Region’s recovery from the triple disaster of 11 March 2011. “Impact on seafood safety of the nuclear accident of Japan” published by the World Health Organization and Food and Agriculture Organization of the United Nations explaining different types of radionuclides and control measures by the Japanese government. Detailed report to the 68th United Nations General Assembly by the United Nations Scientific Committee on the Effects of Atomic Radiation (UNSCEAR) on the effects of atomic radiation, with special supplement on effects of the Great East Japan Earthquake and Tsunami. Reports and articles by the Fukushima Global Communications Programme of the United Nations University, which examines the impacts of the Great East Japan Earthquake, tsunami and nuclear accident of 11 March 2011 on people and society, and the “issues of risk and information provision, aiming to improve understanding of how the threat of radiation is perceived”.